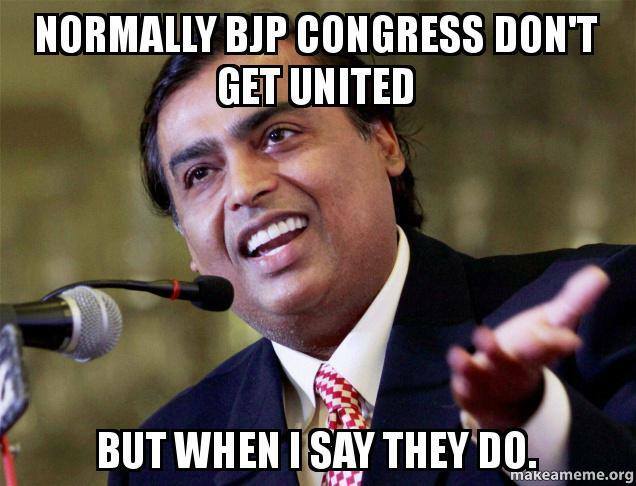 Mukesh Ambani Memes: When Excess Of Everything Gets Trolled | Wotpost. 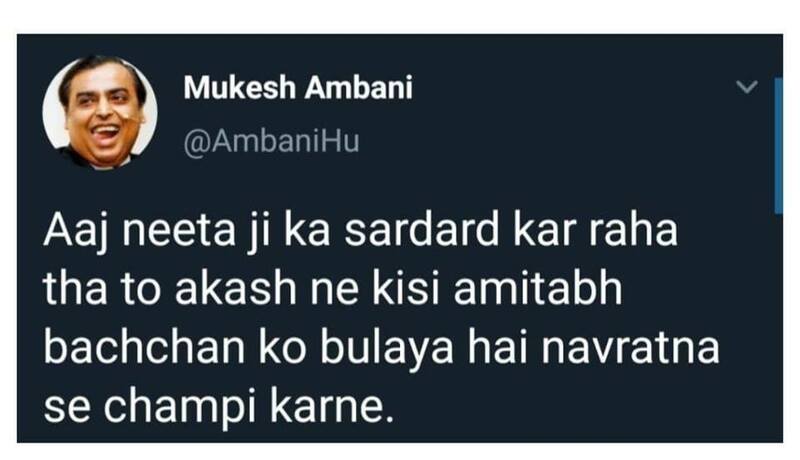 Mukesh Ambani memes or Ambani memes started circulating in March, 2014 when the two biggest political parties Congress and BJP joined hands to defend Mukesh Ambani against Lokpal Bill by the AAP government. 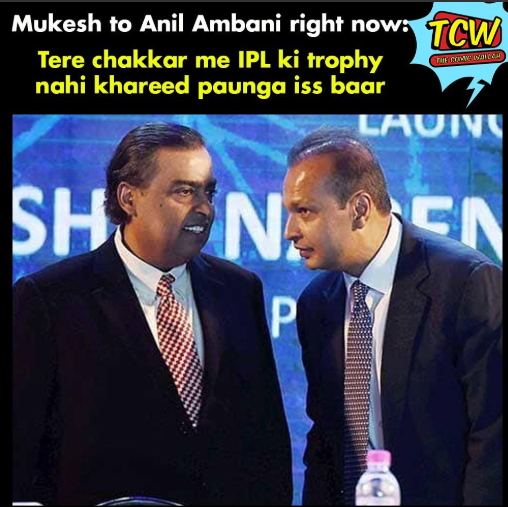 According to the ruling party ‘AAP’, these two parties which were considered as rivals came together in support of Mukesh Ambani since both political parties profited from the unethical money games of the Reliance group. As soon as the news got out, people started commenting and talking about how the parties had sold off their dignity to the Ambanis. Memes were around the lines of how he uses his immense fortune to manipulate even the government. The first troll was by a Twitter user Sachin S. Divekar‏, who uploaded a sarcastic meme on 15th Feb, 2014. The meme was made on the theme of ‘the most interesting man in the world’ which was a dank meme during that time. 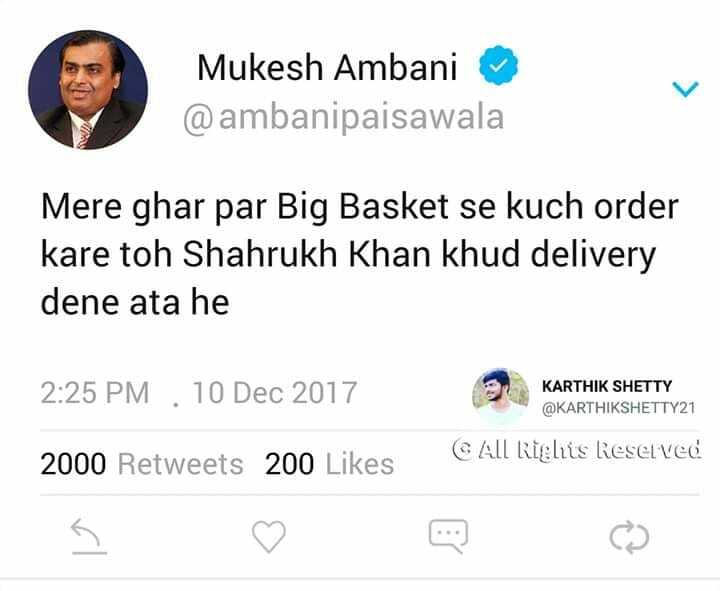 The spread of Ambani memes again came into trend around the year 2017. Meme makers kept mocking him at different stages for his immense wealth and power display.There were various pictures from numerous occasions that were used to generate a number of memes. Some were related to the amount of wealth Mukesh Ambani had while some were around him being caught with funny expressions on a social gathering. They were later manipulated using different contexts to create hilarious memes. 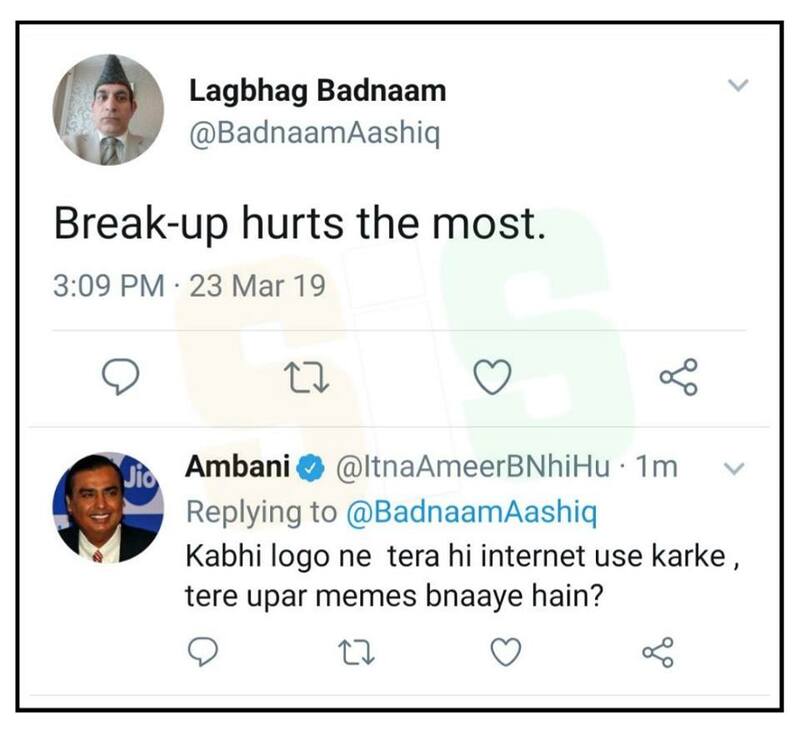 Facebook pages like The Youth, The Sarcastic Indian’s post and Yahoo India posted memes in different contexts that revolved around how wealthy Mukesh Ambani is. The Youth even posted a compilation of various memes that were circulating on various digital platforms. 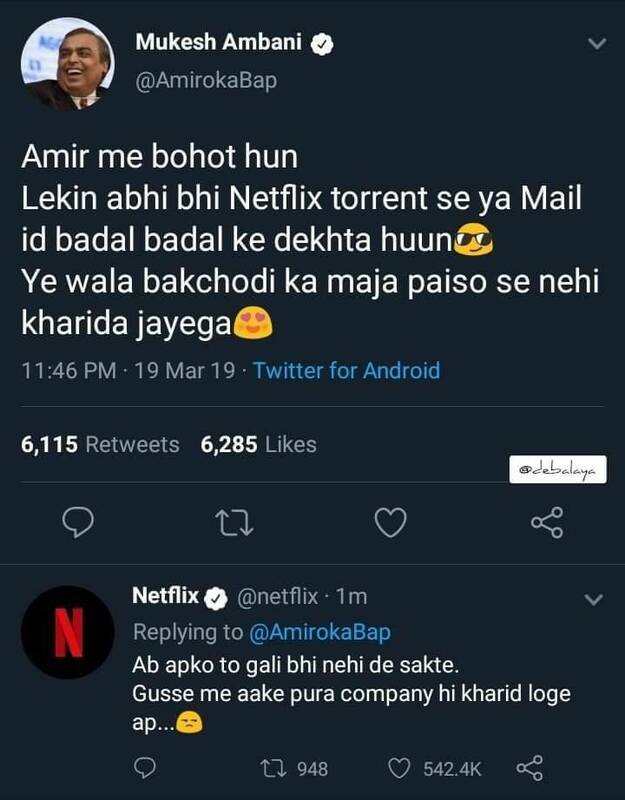 Following the same trend of mocking Mukesh Ambani’s wealth, comedy platform under FabForm Network posted a meme on 30th Oct, 2018 which was around the Diwali festival. 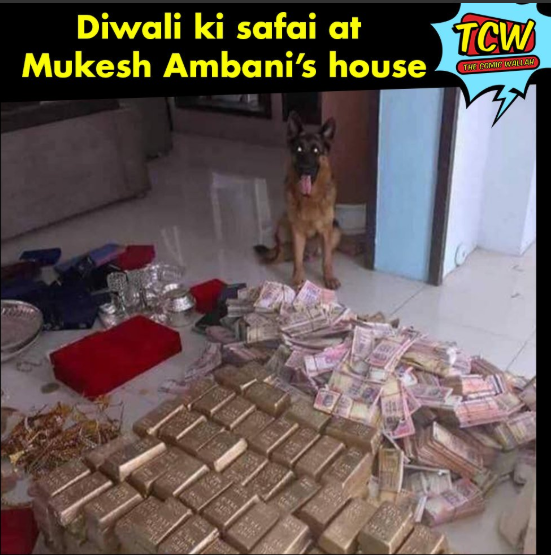 People clean there houses during Diwali and trow out garbage, but not Ambani’s. When they clean their house,this is what they come up with. Apparently, that’s what Comedy platform TheComicWallah posted by posting the following meme. During Priyanka-Nick’s wedding, several memes surfaced on various social media platform that were formed around a specific picture. It was clicked at PC’s sangeet with Mr. Ambani having a weird expression on his face. The meme used this funny expression where he was shown sitting next to his wife. One of the best meme had the caption,” When you fart but feel some liquid too“. Isha Ambani’s marriage was a big deal. There were several memes that were circulated on the family picture which was released online. 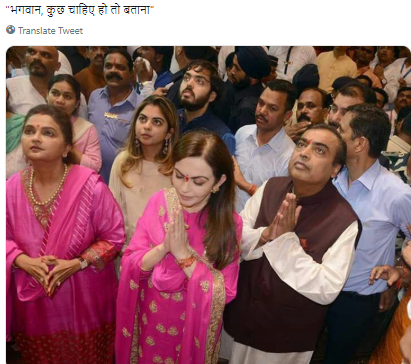 The picture showed Mukesh Ambani with a ‘not so good’ expression standing next to his family and people across the nation started mocking it through meme. 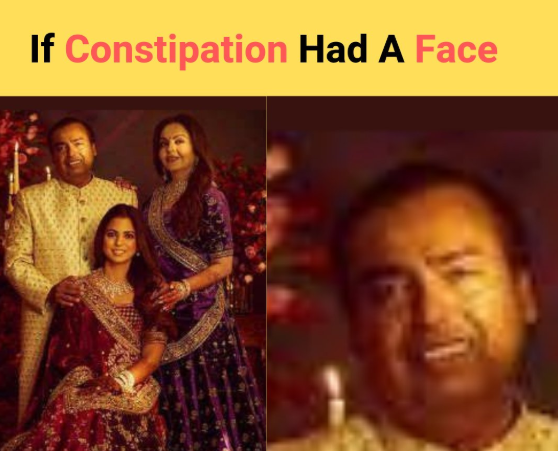 One meme mentioned ,’ If constipation had a face’. along with the picture, that aptly made a viral meme. 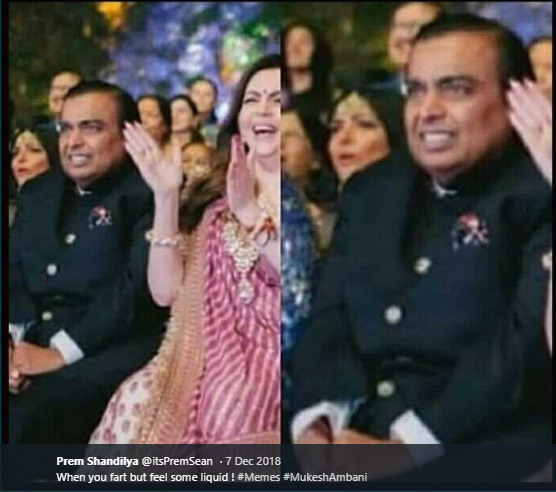 Another meme was created around a picture that was snapped at Isha Ambani’s sangeet. 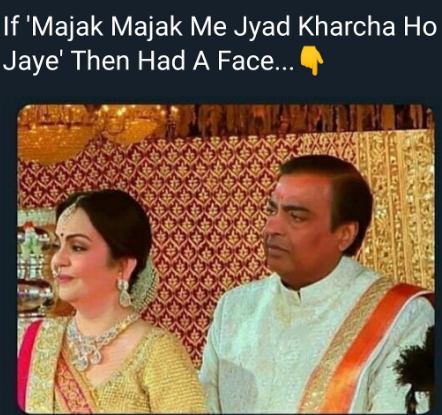 The picture shows a funny expression on Mukesh Ambani’ face where he seems to be annoyed at his wife. This sparked a riot of funny memes being made on this picture. 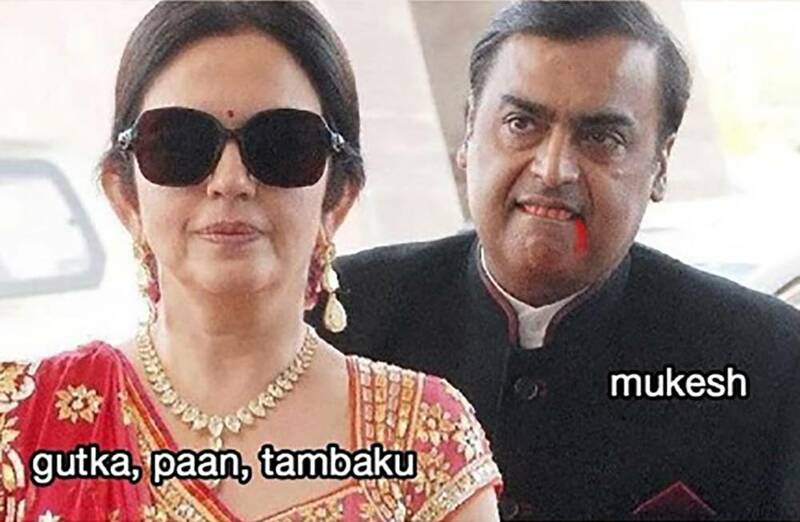 From referring Mrs. Ambani as gutka, pan and tambaku and showing Mr. Ambani as Mukesh Harane drooling in the background, it created one of the most humorous memes. After spending an outrageous amount of money for his daughter’s wedding, a picture clicked during the function did rounds on social media. It looked like he finally realized that he had spent gazillion amounts of money by calling celebrities from all corners of the world. Naturally, the internet users took a jibe on this. Fortunately, he was captured with different expressions that fueled the creativity of meme makers and they came up with memes like this. Ambani launched unlimited free internet on Reliance jio, and the nation went crazy. 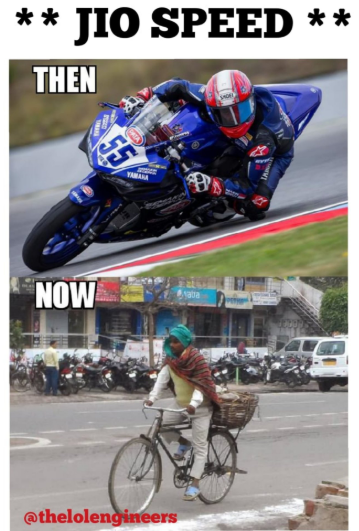 Using his internet, creators started making memes and started flooding the social media platforms.The speed deteriorated eventually and hence people made several memes around the same thing mocking its slow speed compared to the lightning speed it had before. 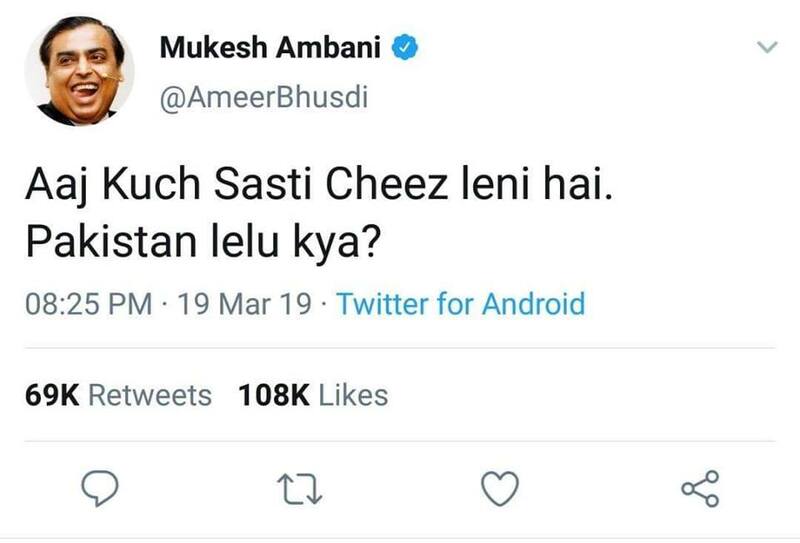 Following the tradition of creating innovative ways to mock Ambani’s wealth, users in March 2019 started tweeting fake messages from parody account of Neeta Ambani, Mukesh Ambani etc. 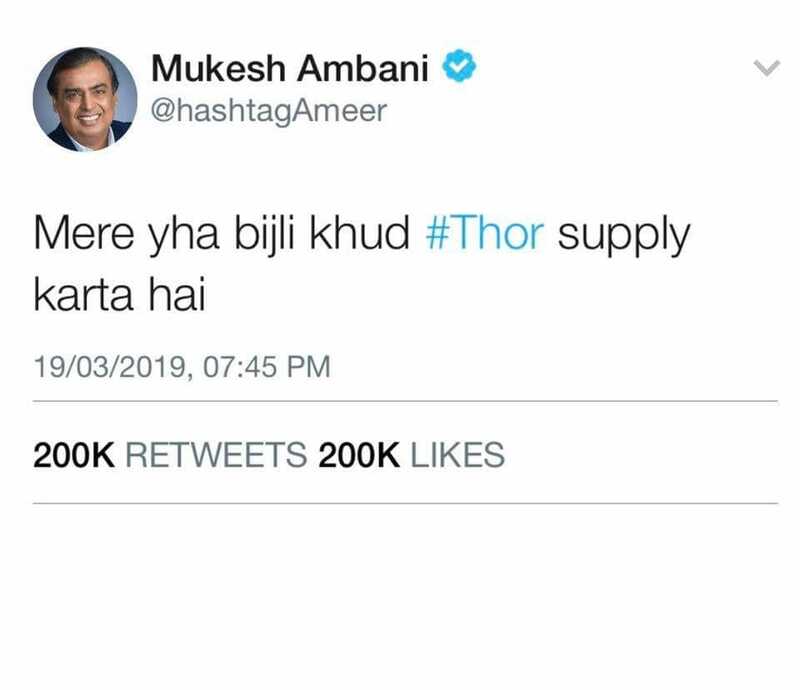 Meme makers and internet trolls started creating fake tweets with the theme where any regular incident that is happening with Ambani results into something extravagant for others. Or something that may seem simple enough for Ambani could be a big deal for other people. 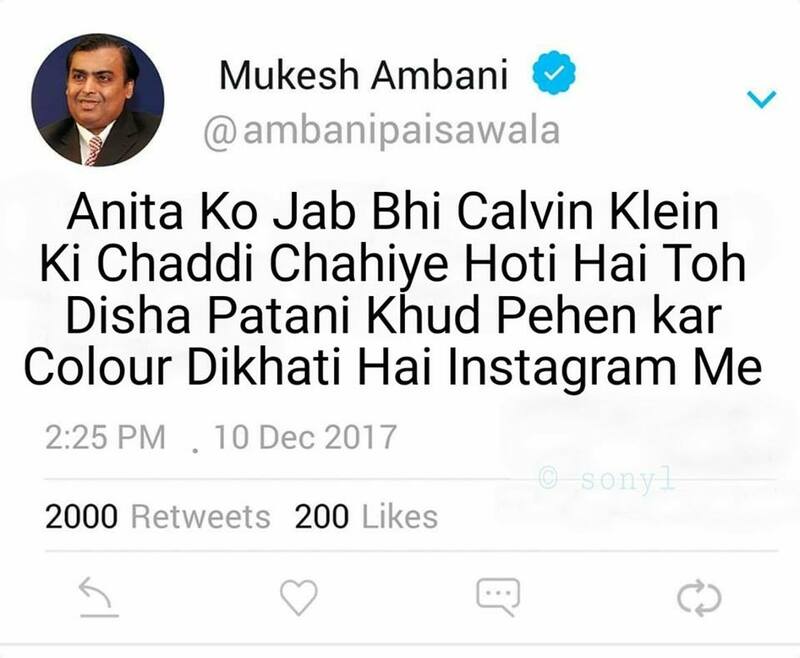 Meme creators made sure to exhaust the humor out of the extravagant amount of wealth Mukesh Ambani has. Be it his family function or business ordeals, his announcements or his pictures, everything had the element that can be twisted to a humorous meme. The makers exactly did the same thing and came up with such jokes every person could relate with. 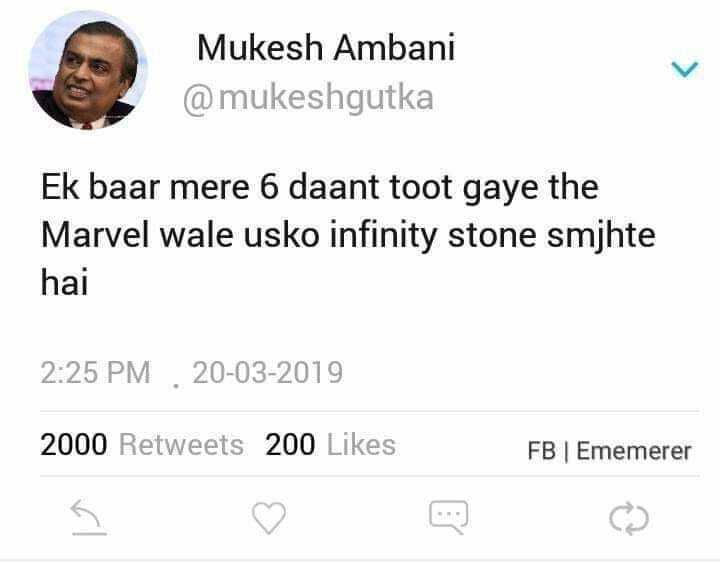 As everyone can relate with the unreal amount of money Mukesh Ambani has and enjoy mocking it as well. Gully boy memes: is this movie actually a rip-off of 8 Mile?